Spiaggia is a luxurious, beachfront vacation home located in the upscale, gated community of Destiny by the Sea, containing some of the finest gulf front vacation homes in the area. 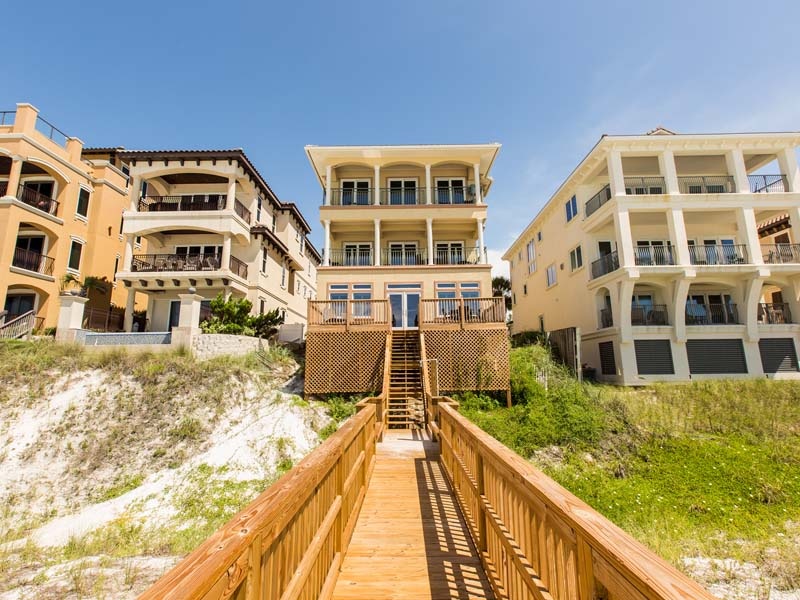 This Destin, Florida vacation rental features grand floor-to-ceiling windows offering mesmerizing views of the Gulf of Mexico for you to enjoy while relaxing in the open living room, which includes a queen sleeper sofa, or while gathered in the sunroom, located on the first floor. A fully-equipped kitchen can also be found on the first floor of this home. Savor the view of the gulf while cooking up a savory meal. 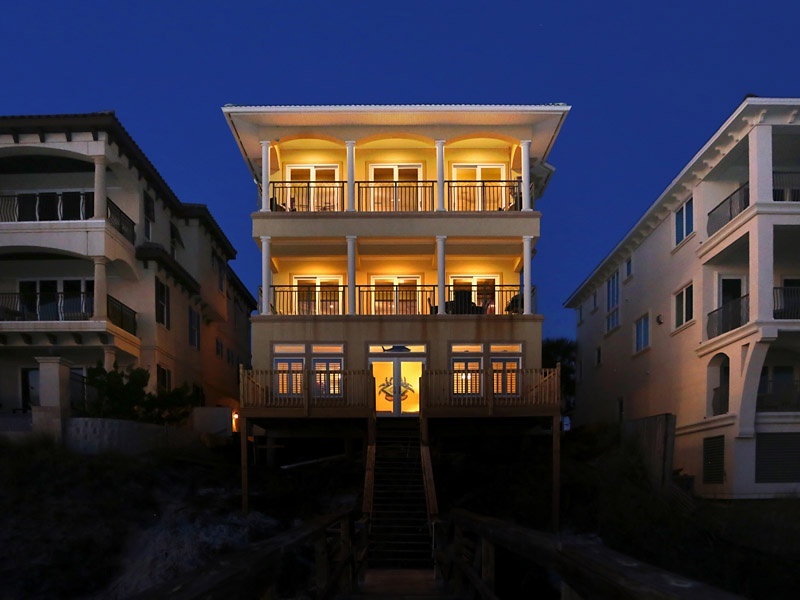 With seven bedrooms and four and a half bathrooms, Spiaggia offers comfortable accommodations for up to seventeen people, making it a fantastic choice for a family vacation or a group getaway with friends along the beaches of the Emerald Coast. Two bedrooms, one containing a queen bed and the other containing a set of twin/full bunks, are located on the first floor. The second floor features the main kitchen, which offers stunning granite countertops and stainless steel appliances, as well as a living area, dining room, bedroom furnished with a king bed and a bunk room with a set of twin bunks. The third floor of this home contains two additional bedrooms, one containing a king bed and the other containing a full bed. You will also find a grand master suite on the third floor, offering a king bed. Delight in additional upscale amenities including whirlpool tubs, walk-in showers, a wet bar, a free standing ice maker, and TVs in each of the seven bedrooms. In case you need to catch up on some work while you are away, enjoy free wireless internet during your stay. Spiaggia vacation home also offers a private gas grill and an outdoor shower for you to take advantage of during your vacation. When you are not spending your time relaxing on your private balcony enjoying the view or lounging in the sand, soaking up some sunshine, take a short walk over to the community pool and hot tub in the Destiny by the Sea neighborhood. Refer to our Gulf Coast Guide for a list of popular dining and shopping options as well as exciting activities and attractions in the area. 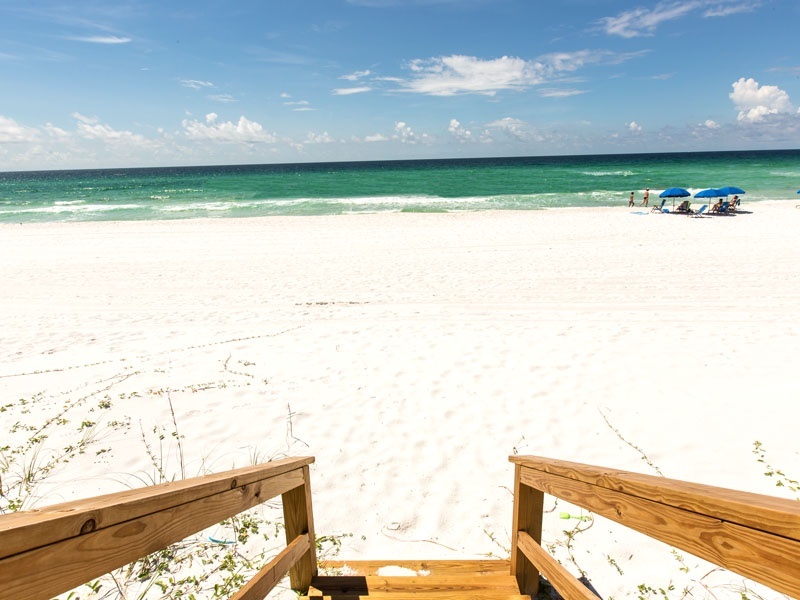 An unforgettable escape awaits you at Spiaggia, perched on the sugar white beaches of Destin, Florida.